t*rexes and tiaras: Tuesday Titles 057.. I've not been sleeping a lot lately, and the only real benefit about that fact is that I've managed to watch six seasons of Sons of Anarchy in about two weeks, and I've got a little reading done. I'm not sure what it is about circuses in books lately, but I seem to be drawn to them like a moth to a flame (speaking of which, a moth was one of the reasons I could not sleep last night - irrational fear alert!). 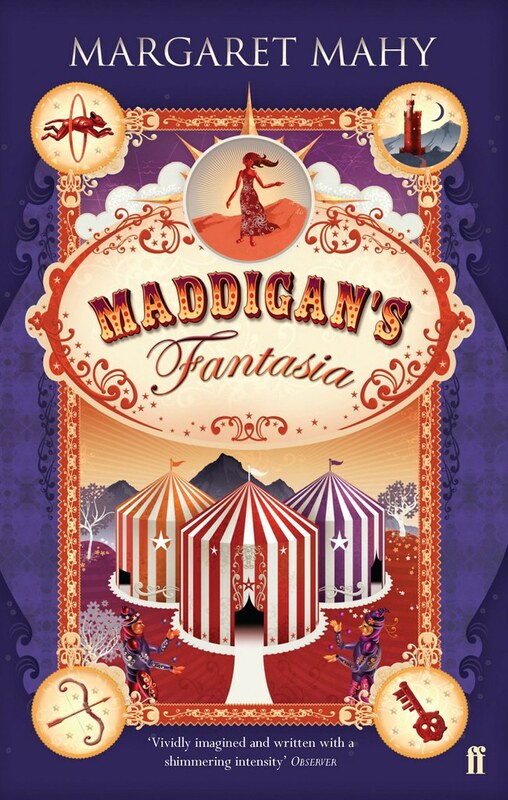 Maddigan's Fantasia is a travelling circus. In a world which seems almost dystopian after near-destruction, the travelling fantasia moves around the world trying to bring joy and laughter back to the world. Before long, it becomes apparent that the circus is being followed, not only by gangs of Road Rats who are intent on causing trouble, but also by three children who have travelled back in time from the future to put things right. Garland, our heroine, is wary of the new recruits, but takes pity on them and hides them from those who are chasing them. This book becomes so much more than a tale of a circus. Time travel, other worlds, adventure and romance come together and the book is so fast-paced it's almost tricky to keep up. Definitely worth a read, though.